This event was at the Farmers' Market. We have it there in order to expose people who may know nothing about an electric vehicle. We had three cars and drivers there. Many people walked by the exhibit and we were talking to interested people throughout the 3 hours of the event. We also had a front page article in our local paper and a letter to the editor. We could not give test drives. 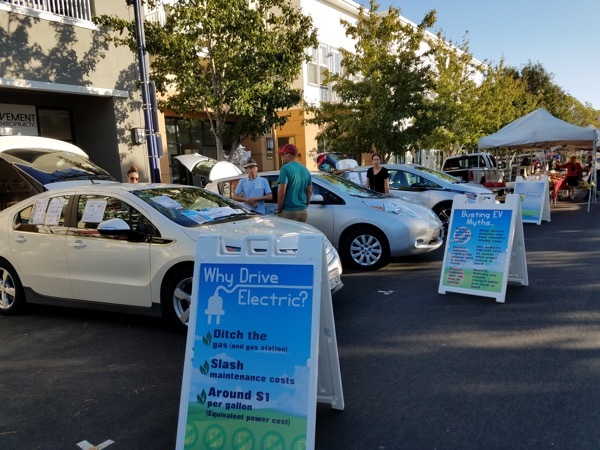 The week before the mayor issued a proclamation for Drive Electric week and we had a banner displayed at our City Park on 1St Street about the event. This will be an exhibition of electric vehicles with owners to talk to and cars to check out. This event is aimed at people who would like to learn more about electric cars. Register to attend above and bring your own EV, and you'll be entered to win a chance at a $250 gift card. We are also sponsoring an EV tailgate party on September 16. Clean the air and the beach. We will be joining the California Coastal Cleanup on Saturday, Sept. 16 at the 9th Street Park. Come at 9, or anytime before noon, to help clean the beach and then we will have a tailgate party from 12 to 1:30 where we can show off our cars to participants of Coastal Cleanup and explain why we drive electric. Registered attendees report 101,400 electric miles driven.